It's been a great week for musical theater here at Cherry and Spoon. I saw two of my favorite musicals; both productions are fresh, interesting takes on a classic by a local theater company, featuring a great cast led by one of my local faves, at a charming historic venue. 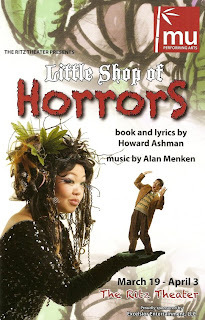 Earlier this week I saw Frank Theatre's brilliant Cabaret at the Minnesota Centennial Showboat, and last night I saw the quirky, funny, heart-breaking, bloody little musical Little Shop of Horrors by Mu Performing Arts at The Ritz Theater. The fact that this version of Little Shop features an all Asian-American cast is not what makes it unique and in-ter-esting (like that plant in the window). It's a production full of new and innovative choices, the biggest one being that the man-eating plant, Audrey II, is played by a woman. This offers a whole new dimension to the plant, giving it more character, and to the play as a whole. In other versions I've seen, Audrey II is played by a black man with a deep, booming voice who never appears onstage in bodily form. This Audrey II appears onstage along with the puppet version of the plant, so you're watching the actor and the puppet simultaneously (similar to Avenue Q, which I'm looking forward to seeing at Mixed Blood in a few weeks). Sheena Janson plays the plant as a sultry, seductive devil on Seymour's shoulder. She doesn't often speak, but she's always there in the back of the flower shop, letting us know exactly what she's thinking by the expressions flitting across her face. The audience can more clearly see how Audrey II is driving the action in Seymour's life. Audrey II gives Seymour everything he ever wanted, but like most deals with the devil, there's a price and it doesn't end well. Who else would play Seymour besides the multi-talented Randy Reyes? I can't think of anyone better for the role, regardless of race. The role suits him very well, both vocally (I've never heard him sound better) and as an actor. He gives Seymour that sweet, nerdy, charm that makes the audience root for him even as he's killing people. It's not his fault, the plant made him do it! And his love for the original Audrey, Sara Ochs, is unconditional and beautiful. Seymour and Audrey are two broken people who find each other. He treats her the way that she deserves to be treated, and she sees the potential in him. "Suddenly Seymour" is one of my favorite musical theater duets of all time, and Randy and Sara do it beautifully. Sara also does a beautiful job with my other favorite song, the sad longing lament wrapped up in '50s idealized domesticity, "Somewhere that's Green." This is an all-around great cast, from Eric "Pogi" Sumangil as Audrey's sadistic dentist boyfriend with the demented laugh, to the girl group Greek chorus of Katie Bradley, Molly Pan, and Suzie Juul, and everyone in between. The orchestra sounds great, which is no surprise since it's directed by Denise Prosek of Theater Latte Da. The plant puppetry and costumes are really well done (I particularly liked Audrey II's crazy plant hair and eyelashes), and the set is interesting and well-utilized by the cast. Little Shop of Horrors is just a typical boy-meets-girl story. Boy meets girl, boy wins girl, (spoiler alert!) girl gets eaten by boy's plant. Mu does a wonderful job with it. It's playing through next weekend so go check it out if you love a good man-eating plant story as much as I do.